The bar was eventually raised to 56.375km by Chris Boardman in 1996, before the UCI banned the types of bikes and ‘superman’ riding style that allowed such speeds to be reached. Now, only traditional round-tubed diamond frames with spoked wheels and drop handlebars are allowed. 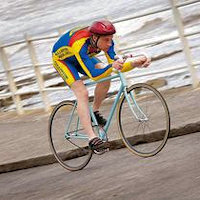 Luckily, Obree knows how to build bikes.